Latvia: Out of the crisis - into the euro? 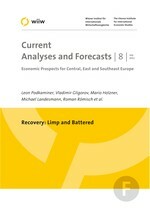 For the whole year 2011, we expect the Latvian GDP to grow by 3.6% in real terms. Gross fixed investment, especially in industrial sectors, as well as the process of restocking are expected to act as the main growth drivers this year. The financial situation of indebted households and high unemployment will allow private consumption to increase only slightly, while the government’s consolidation measures will further reduce public consumption. Although the current account will still remain positive in 2011, net trade will contribute negatively to overall economic activity. In the years 2012 and 2013, GDP growth is likely to pick up further to 3.8% and 4% respectively, mainly thanks to the ongoing revival of capital investments. A slight amelioration of the labour market situation and some revival of real incomes should allow households to expand consumption henceforward more swiftly again.